This fascinating object came up on the first day on the site proper, along with a few rough looking bronzes and a stunning denarius of Domitian. At first I hadn't a clue what the hell it was for apart from it being some kind of swivel. My best shot was the swivel from a dog's lead, but that failed completely to find any kind of roman world match, so I was left dangling by it for some considerable time. 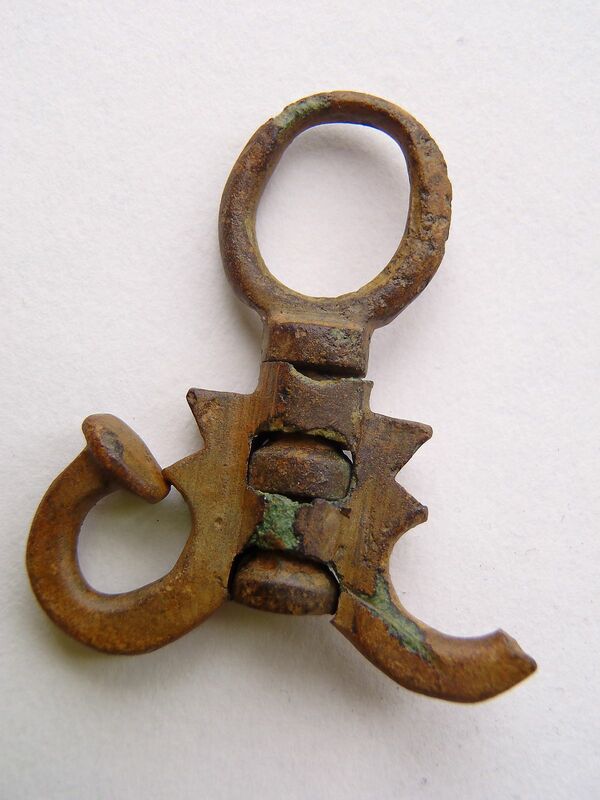 The patination types of objects, ancient or otherwise, buried in ones local soils are something learned by degree, but, they tend to be particular, and after many years digging up all kinds of things made of copper alloys, it's possible to assess quite accurately the period of otherwise un-datable scraps and fragments without any recognisable shape. Of course such a subjective method this is fraught with problems, but in the main, it works. The patination of this object was fairly thick, the original metal of the surface long mineralised by thousands of years of burial in slightly acidic clay, and, it was brown-coloured too, and because later medieval material hardly ever is any other colour than green in this locality, therefore it was Roman, or older still. It was also a feat of technical bronze casting I have yet to fathom, the whole thing seemingly cast in one go, but in two perfectly formed pieces that are captive to each other, turn freely around each other, but with no visible way of making that happen except by magic! I must have endured six months or more trying, before I finally conceded defeat at my favourite game of hunting down the true attribution of unknown things entirely under my own steam, and decided to throw the object open to a wider audience in hope of an answer. The answer, when it finally came, came from none other that great friend to detectorists and proper expert on many things, Dr Kevin Leahy. What he delivered was not just an answer, but the definitive article. He sent over a picture from a book by Joan Liversage in which such a swivel is depicted as the suspension swivel for an oil flask complete with suspension chains. 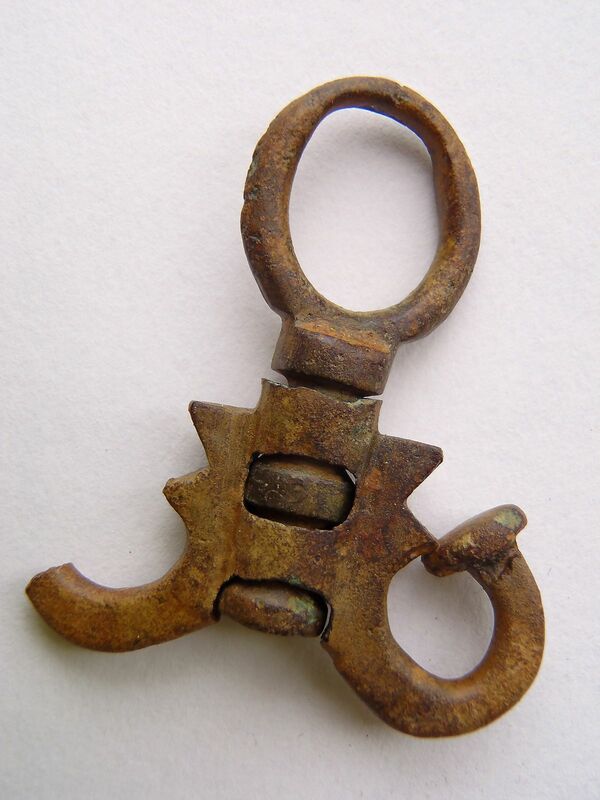 Not only was the swivel in that picture identical in function, but very near identical in form too. It was a remarkable ID, but of course, the item then begged the question — were there ever hot baths on site where an oil flask might be used? Well, the site always seemed rich enough for such luxuries to be available to the occupants, but now that I think the site to be a halfway house, or mansio, with a commercial interest in laying on creature comforts for paying customers, then I don't really see how the proprietors could not have provided hot baths. It would have been demanded, surely? The only trouble with that idea is that there doesn't seem to be much in the way of a fresh water supply nearby, well not one bountiful enough to supply baths with. The river is a mile away and the site is on dead flat elevated ground, which would have meant an artesian well or spring supply. However the area abounds in springs, and there appears to be one in a nearby wood, or at least a stream has its source within it, so perhaps that is how water was got? Perhaps one day the site will be excavated and then it'll all become clear, and if the Roman road is one day confirmed as such and the site suspected as something more interesting than just another Roman farm, then perhaps that'll happen. Till then, I'm not holding my breath. 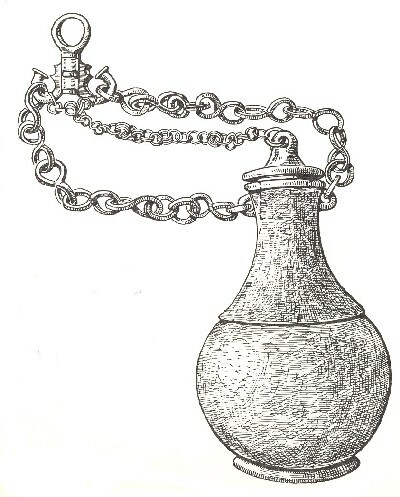 Roman bronze oil flask suspension swivel. 44.5 x 37mm. Epping Forest District, Essex. Ref: Joan Liversage, 'Britain in the Roman Empire' 1968, 127, fig. 50.